Can approaching business with a focus on creating value, having impact, and putting the needs of others ahead of your own really work? According to the Go-Giver's five lessons of "stratospheric success" and the parable that illustrates them, the answer is yes. Before I get more into it, I must confess that I'm not usually a fan of business books told as a parable, but this "little story" won me over immediately. 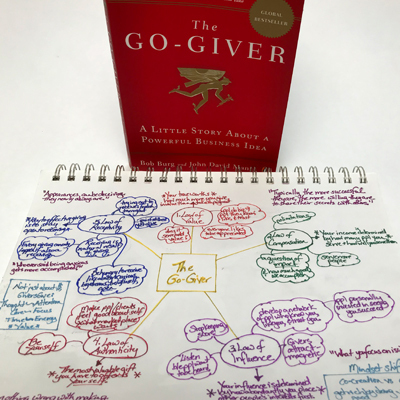 Joe, the main character who starts out as a "go-getter," provides the initially skeptical voice that the reader might be hearing in his/her own head about some of the lessons. And although the conclusion may seem a little farfetched, Joe and his story had hooked me so I wanted to believe it. Does the world really work this way though? 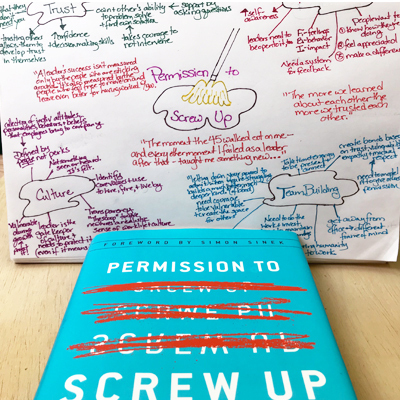 As Arianna Huffington captured so well in the foreword, "People want to believe that this is the way the world can work...But then, too often, we feel pressured by the voices (both external and internal) of cynicism and resignation, telling us, It's a dog-eat-dog world out there - you've got to look out for #1." What can we learn from Joe and his mentor Pindar to help quiet those voices? Internal Voices: Without specifically using the term mindset, the book identifies a number of mindset shifts that lead to characters effectively quieting their negative internal voices. 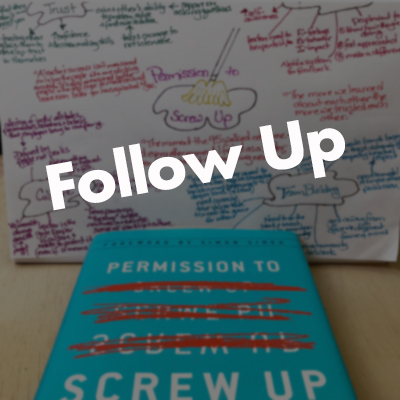 One of the mentors in the book talked about her husband giving her a gift that took a year to "unwrap, open, understand and use." I bet that when he first ended their marriage, she didn't have that mindset. She probably saw it as a failure, not an experience to learn from. Or another mentor that had built a successful education software business only after she got rid of the belief system that "there are people who get rich, and there are people who do good...you're one or the other, you can't be both." As I've mentioned in many places in this blog and during our workshops, mindsets are powerful. Paying attention to how we react when it comes to business conversations/decisions can reveal a lot about our own mindset - where it's getting in the way and where we need to make adjustments. Sometimes it's as simple as that - awareness, adjustment, and change. It's a continual process because we all have lots of baggage that comes from past experiences, what we've been taught by others, things we've read, etc. I find that observing what's working and what's getting in my way with curiosity and without judgment tends to be most effective. 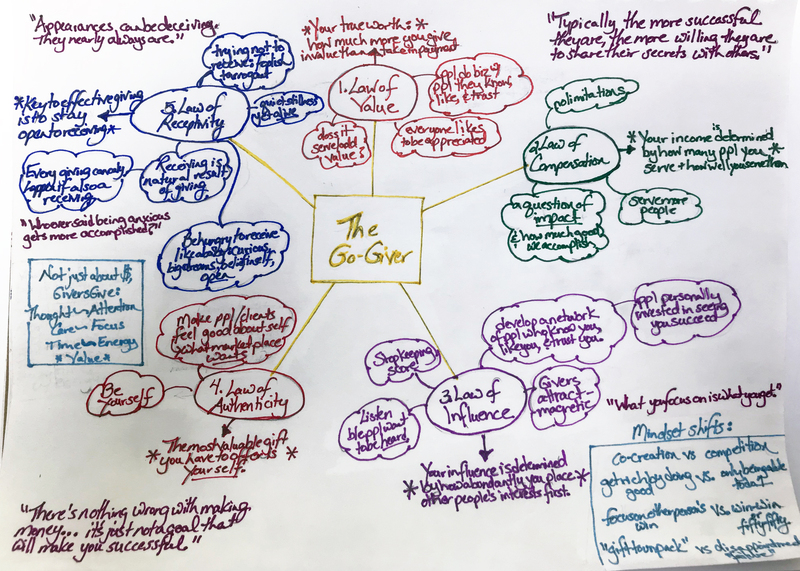 External Voices: The Chamber's Leadership Lit group discussed Go-Giver this month and most of the ideas of the book resonated with attendees. Granted, people that buy into the dog-eat-dog world mindset probably wouldn't "waste time" with reading a book that contradicts their worldview, but I'm okay with that. I liked having the opportunity to meet business people in my own community that share some of the same ideals and business practices as me. It's a way for me to broaden my circle of "external voices" that will push me to be successful in a way that feels more authentic to me. Now when I see them at other Chamber events, I know I can go a little deeper and ask about how they've been acting authentically or with receptivity lately instead of just the usual small talk. It's my way of building a network of people "personally invested in seeing you succeed." The group also got into an interesting discussion about mentorship. 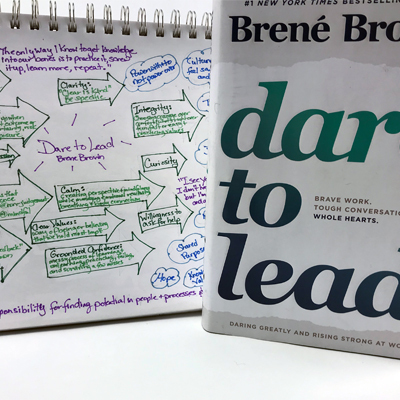 The book claims the following about business people, "Typically the more successful they are, the more willing they are to share their secrets with others." Most agreed with this statement. I know in the past, I've hesitated to ask for guidance for a variety of reasons: not wanting to bother the person, assuming they're too busy, not wanting to admit not knowing something, etc. I love having conversations with colleagues brainstorming with them about their business and possible growth opportunities, but I haven't served in a mentor role. Because of this, I didn't realize that experience could also provide value to the mentor. One woman in our group helped shift my perspective. She talked about how mentoring has led to her being more mindful about her own business practices and that it caused her to pause long enough to notice more. She also appreciated the fresh perspective that her mentees have given her. The book identifies the critical balance between giving and receiving. Apparently that also applies to asking for and being receptive to help or mentorship. In doing so, you're providing an opportunity for the mentor to give as well as grow. Applying the Laws: I guess the only way to know whether this approach works is to test it. I love that the mentor in this story gives Joe the condition that he must apply the law each day. How many times do we read a good idea or hear a motivational speaker, but then go back to our daily routine with no change? One woman in our group said she wrote each lesson on her calendar assigning herself homework just like Joe had. I can't wait to check in with her to hear how it goes. - How can we broaden our base of people that know, like, and trust us? - When am I still seeing make money and doing good as separate actions? Why? - Where am I holding back parts of myself and not being fully authentic? - How can I open more to receiving? One of my favorite parts of the book is the magical description of how Joe feels when he's finally shifts to feeling receptive. "He felt an odd smile of contentment bubble up from inside and spread over his face. He stopped moving and listened to the quiet stillness in the normally busy office. What was he feeling? The quiet almost felt as if it were alive. Motionless, but listening." - When should I stop moving and listen more carefully?